Believe what you hear: A healthy breakfast really is the most important meal of the day. The key to this claim is a healthy breakfast…..that is, one that includes complex carbohydrates (like whole grains and fruits), filling protein, and a small amount of good fat. Oatmeal is always a staple in my house. It’s so easy to make and its versatility allows me to fulfill any sweet craving I have (hence this blueberry muffin oatmeal and my pumpkin spice latte oatmeal). Although I’m always in the mood for a warm bowl of oats, sometimes they are too dense and lack the fluffy breakfast bowl I am wanting in the morning. Enter egg whites. Yes, egg whites in your oatmeal. Just trust me. You thought you knew how to make fluffy oats, but wait, you don’t know what you’ve been missing until you make these!! This breakfast is an excellent balance of protein, fat, and carbohydrates thanks to the egg whites and protein powder. I used vanilla protein powder that was naturally sweetened so I there is no additional sweetener such as honey or agave. Plus the blueberries add some additional natural sweetness. If you choose to leave out the protein powder, be sure to eat it with a side of lean protein to keep it balanced and to stabilize your blood sugar. 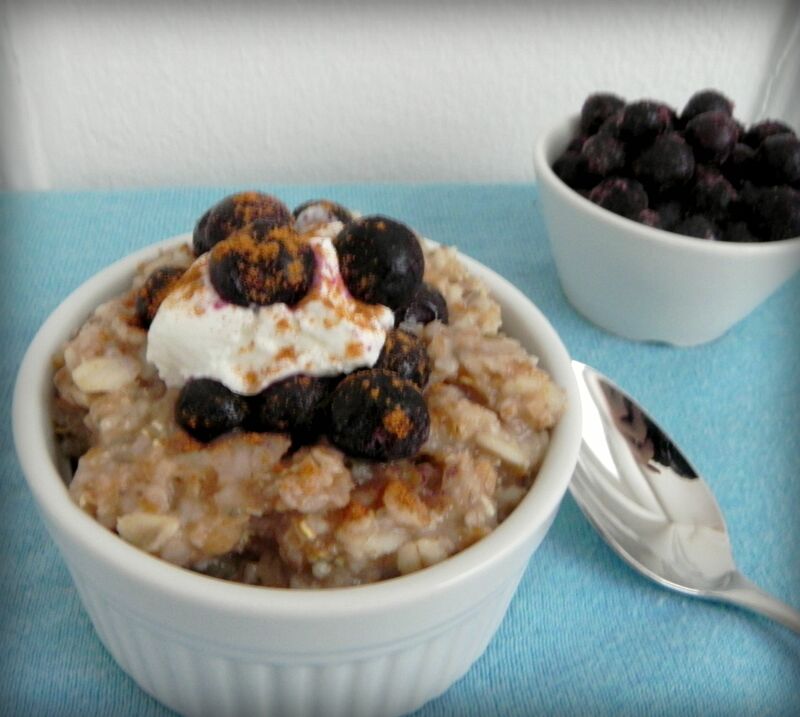 Dysphagia Level 1 – Pureed, Level 2 – Ground/Mech Soft –puree cooked oatmeal with blueberries and yogurt until smooth. Add more liquid as needed until smooth consistency is reached. Omit almonds. Dysphagia Level 3 – Soft – cook oatmeal according to recipe. Mash blueberries and add to oatmeal. Omit almonds. Mix the oats, water, and egg whites together and microwave for 2-3 minutes. Stir in rest of ingredients and top with a dollop of fat-free Greek yogurt and sliced almonds if desired.